Horse care takes time, and there are things you should have a routine of daily, weekly, monthly and yearly tasks to properly care for your horse. The best way to keep track of what must be done and scheduled is to keep a calendar. You will find that you will develop your own. For example, not all horses must be trimmed every six weeks. You may need trimming every five weeks, or every two weeks. Some horses need their teeth checked more than once a year, and some vaccinations may have to be given more than once. A visual check at very minimum once a day, and more often is essential. You'll want to check for any sign of injury, illness and check fences and other structures in your horse's home for damage that could cause problems. Access to plenty of food and water is not to be neglected. Provide your horse with fresh clean water. Clean, readily available water is essential for good horse care. Provide your horse with adequate fodder and concentrates. If feeding hay, your horse will eat approximately 2% to 3% of its body weight every day. Provide adequate shelter and blanketing according to the weather. The design of your shelter, whether run-in shed or stable is very important for proper care. Horses need a place to get out of the wind and wet. Do a visual check for scrapes, cuts, bruises and puncture wounds on your horse's legs, head, and body. Treat any injuries promptly. You should have a horse first aid kit on hand. Do a visual check for signs of illness such as runny eyes or noses, or sounds of coughing or wheezing. 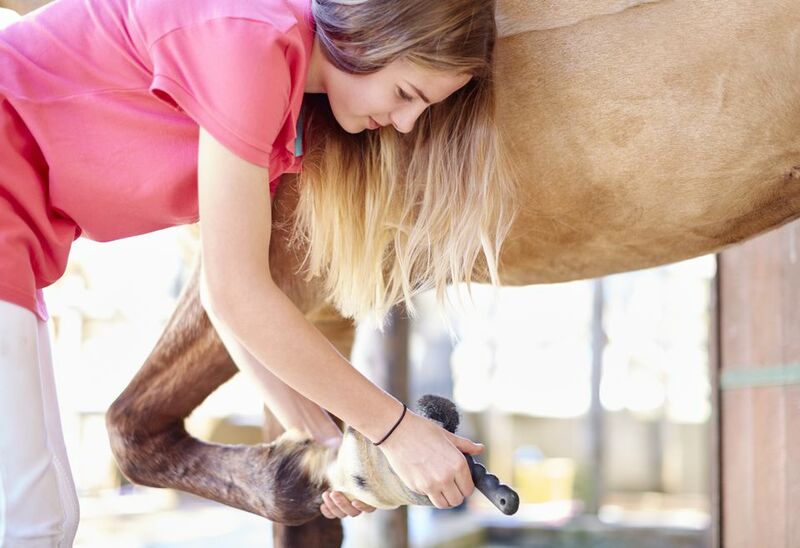 Clean your horse's hooves and check for bruising or cracks, or loose shoes. Muck out the stall if your horse is stabled. Ammonia from urine and manure is harmful to horse's lungs and hooves and can cause problems like thrush. There are a few things you should check weekly. Having adequate supplies on hand is important, as is looking after the small chores before they become big ones that no one wants to tackle. Check the amount of concentrate, fodder, and bedding on hand. Try to have at least two weeks supply on hand, so if there is an emergency you don't run short. If you care for your horse on a small acreage, clean manure from paddocks. This cuts down on flies, keeps the grounds clean for the same reason you'd clean a stall, and makes a nice environment for you and your horse. Check fences for broken rails, loose wire, protruding nails, loose gates etc...that could cause injury. Scrub out water trough and feed buckets. Built up concentrates on the inside of feed buckets can spoil, and troughs can get soiled with chaff, dirt, and algae. If you board your horse at a stable, make sure your board bill is paid on time. Have your farrier in to trim hooves or re-set horseshoes. Leaving hooves to grow too long is hard on your horse's legs, and unhealthy for their hooves. There's a lot of variance in de-worming schedules. Some people feed a daily dose of medication, some have a six week or nine-week schedule. After the first hard frost, or once the fly season is over, you may also want to de-worm for botfly larvae. Administer de-worming medication. It's important to have a de-worming schedule to keep your horse healthy. The types and frequency of vaccinations you'll give your horse will depend on the diseases prevalent in your area. Your veterinarian is the best resource to help you decide on a schedule. Have teeth checked and floated by an equine dentist or veterinarian. Some horses may need checking and floating every six months. Have immunizations administered by a veterinarian.